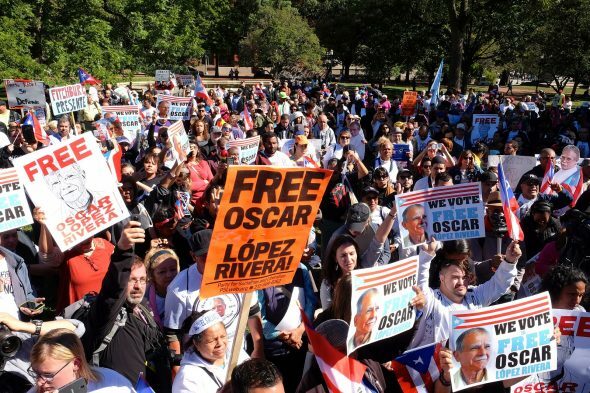 The National Boricua Human Rights Network (Chicago Chapter) wishes to thank all those who joined us in the Interfaith Freedom Convocation and Cultural Celebration for Oscar López Rivera a successful event. We documented that over 2,000 people from over 25 cities were mobilized. We want to thank the following organizations, in Chicago, for their support: Chicago Puerto Rican Agenda, Dr. Pedro Albizu Campos High School, Segundo Ruiz Belvis Cultural Center, Centro Sin Fronteras, New Life Covenant Church, Hispanic Housing Corporation, Community as a Campus, Norwegian American Hospital, and Urban Theater Company, National Museum of Puerto Rican Arts and Culture, as well as the more than 160 people who pooled their resources and made their way to Washington DC on bus, car, rail and planes. Additionally, we must acknowledge the hard work, dedication and commitment of the following individuals, organizations, networks and internationally: Congressman Luis V. Gutiérrez, Ingrid Vila and the Coalition for the Liberation of Oscar Lopez Rivera in Puerto Rico, Speaker Melissa Mark Viverito, New York City Council, Rev. Luis Cortés of Philadelphia, as well as the elected officials present: Councilor Jossie Valentin, Holyoke, MA, Councilor Angel Arroyo, Lorain, OH, Felix Arroyo, Register of Suffolk, County, MA, State Rep. Angel Cruz, PA, State Rep. Leslie Acosta, Philadelphia, PA, State Assemblyman Jose Rivera, NY, State Rep. Minnie Gonzalez, Hartford, CT, Democratic Candidate to US Congress, Adriano Espaillat, State Rep. James Flores, Willimantic, CT. And although she could not be present, Maria Sanchez Quinonez, City Councilwoman, Philadelphia who has supported freedom for the Puerto Rican political prisoners for the last 25 years and for Oscar, especially in the last period, was responsible for the donation of the bus from Philly. Our apologies for the omission! Others who worked very hard to assure the success of the event: Mairym Ramos, Gretchen Sierra-Zorita, Paul Magno, Melisa Diaz and Enrique Fernandez Toledo. Not all could be present physically, but all contributed to the success of the convocation. A special thank you to the Interfaith team for their grace in helping to put that part of the program together under pressure: Matt Meyer, Nozomi Ikuta and Paul Magno. Next Post: Oscar Lopez Rivera in President Obama’s House!